AllChange can be fully integrated with Borland’s leading development suite through the Athlant software from Devrace Software. Athlant is a visual tool enabling the integration of AllChange into the Borland Delphi environment, including C++ Builder. Source control is vital for professional software development. It is necessary to manage your source code, trace the changes that have been made, make modifications and control group development. AllChange’s version control capabilities give you all this and more. Use standard source control functions as “Add to Control”, “Check Out”, “Check In”, “Get History of Changes”, “Show Difference”, etc. Athlant enables developers to work with systems directly from Borland environments. 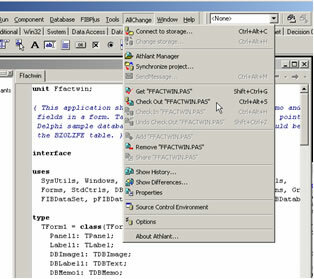 Athlant is integrated into the main IDE menu, toolbar, CodeEditor, Form Designer and Project Manager. This enables you to have full control of your files on any development stage. 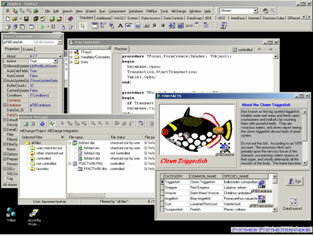 It is compatible with Delphi 5-7 and C++ Builder 5-6 with Professional and Enterprise editions. The Athlant Interface is available from Intasoft as an add-on to AllChange. Full screen with Delphi IDE and Athlant connected to AllChange project. Setting active SCC Provider in Athlant options to AllChange. Calling AllChange functions from Delphi Visual Form Designer. Viewing project files in Athlant Manager. 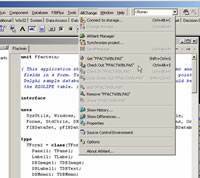 Viewing a history of file changes in Delphi IDE. General menu of Athlant with active AllChange SCC provider.